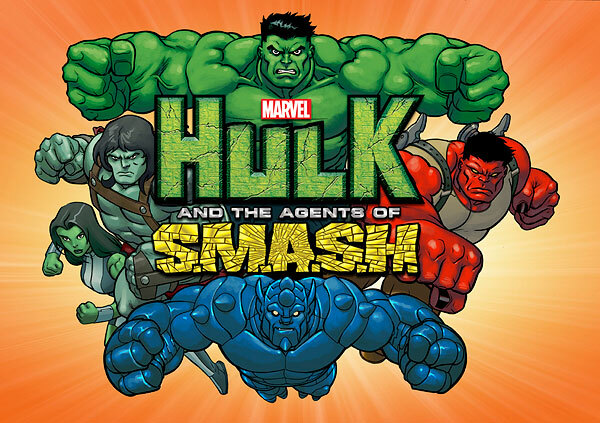 Coming to Disney XD this Sunday is the newest of the new Marvel Universe animated series – “Hulk and the Agents of S.M.A.S.H.” Now I don’t know what S.M.A.S.H. stands for, but I did get a chance to see the first episode, the first part of a story called “Doorway to Destruction” which airs on Disney XD this Sunday. Check out my review, right after the jump. I’m not going to comment about how this happened right about the time we learned that over at DC Comics there were not just Green Lanterns but also Blue, Yellow, Orange etc., but it does seem odd. Marvel Comics started to diversify in the Hulk department. Having so many Hulks just makes the real one less special, right? I have the same problem over in Avengers. To paraphrase Syndrome in The Incredibles, if everyone is an Avenger, no one will be special any more. Anyway, besides Bruce Banner, the original, his cousin Jennifer, She-Hulk since the 1970s, we got new Hulks. General Ross, constant foe of the green goliath, became the Red Hulk. His daughter, and tragic love interest of Banner, Betty Ross became the Red She-Hulk (nowhere to be seen in the show btw). They turned everybody’s favorite sidekick, Rick Jones into the gamma-powered blue-hued A-Bomb, and also threw in Skaar, the Hulk’s son from Planet Hulk as well. If they wanted to, they could have thrown a number of other gamma-powered and/or green characters into the mix as well. They could have even added Xemnu the Titan, who was Marvel’s first Hulk back in the Atlas Comics days. Personally I think it’s just too many Hulks, and honestly I think that the Rosses and Rick Jones work much better as human supporting cast, but apparently that’s just me. Written by Paul Dini, who had a hand in perhaps one of the best comic book adaptations ever – “Batman The Animated Series” – and creating the DC Animated Universe, this series has a chance beyond its initially silly premise. Adding to that potential is a terrific voice cast that includes Clancy Brown, Seth Green, and Eliza Dushku. Returning as the Hulk is Fred Tatasciore, and I hope this doesn’t mean that he and his character will be leaving the animated Avengers. The premise of the series is subtextually that of family, because the Hulks are a family of sorts, but overtly, Rick Jones is making a reality show about them, essentially to prove the Hulk is a hero, not a monster. Actually, I thought that’s what the Avengers were doing, but I digress. The reality show format allows the characters to do confessionals, which are some of the best bits in the show. As we open in the pilot episode, “Doorway to Destruction” (Part 1), we are introduced to a slightly smarter, slightly better dressed Hulk who lives under the abandoned, but still powered, Gamma Base, with pre-A-Bomb Rick Jones, near the town where he became the Hulk and is beloved. There is no mention of the Avengers, yet Hulk knows Annihilus, Kang, Doctor Doom… what’s up with that? I thought the whole reason behind jettisoning “Earth’s Mightiest Heroes” was to have consistent cohesive continuity between all the Marvel TV series? A dimensional gate opens up over Hulk’s hometown. 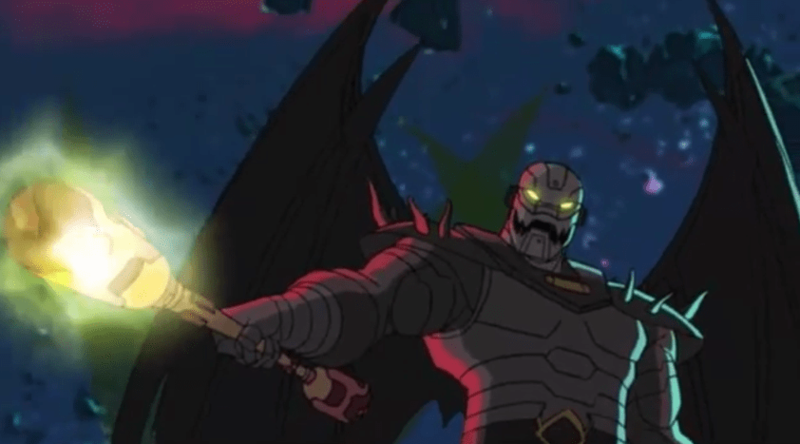 It’s Annihilus looking for a way to Earth from the Negative Zone. He and the Hulk exchange greetings like old frenemies then the bug man sends the jade giant a present, an opponent to fight – Skaar. Hulk doesn’t seem to know him, yet Rick notices right away they look like each other. He says it, but the visuals don’t quite make it so. Hulk’s hometown of Vista Verde, New Mexico is kinda fun. In the battle we see the town taken apart in a background slugfest tour. Everything is about the Hulk. There are statues, giant props, businesses, even a car lot named Smilin’ Stan’s with Stan Lee’s voice and a Hulk face that could have been drawn by Herb Trimpe. Red Hulk shows up to help with Skaar, who of course escapes, allowing Annihilus access to Earth. I find that Red Hulk is just as annoying in animation as he is in the comics. And I always liked General Ross, misguided bad guy that he was – but this Guy Gardner wannabe has got to go. It’s also curious how Red Hulk and Skaar both have Hs on their belts before any type of team is formed. 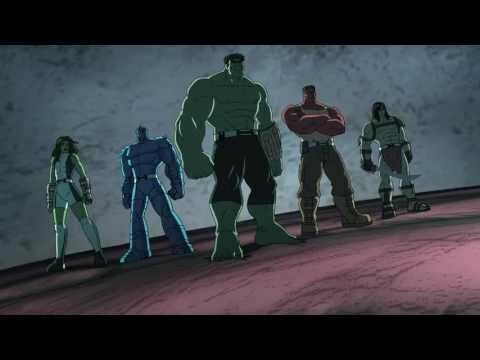 As with all Marvel’s recent animated series, including my much loved “Earth’s Mightiest Heroes,” this show has so many washed out colors. Everything is faded. No, scratch that, the heroes’ colors are faded, while the villains are so bright. Why is this? Let superheroes be superheroes, they wear colorful costumes! I of course have only seen Part 1 of “Doorway to Destruction,” with Part 2 to be aired right after the premier of Part 1 Sunday on Disney XD. 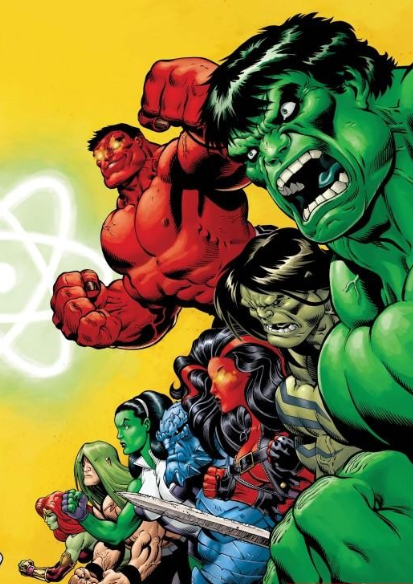 We have yet to see Rick become A-Bomb, any indication that Hulk and Skaar are related, and no sign of She-Hulk yet. Really didn’t like the show at all. It was, to me, so dumbed down that it was impossible to enjoy. 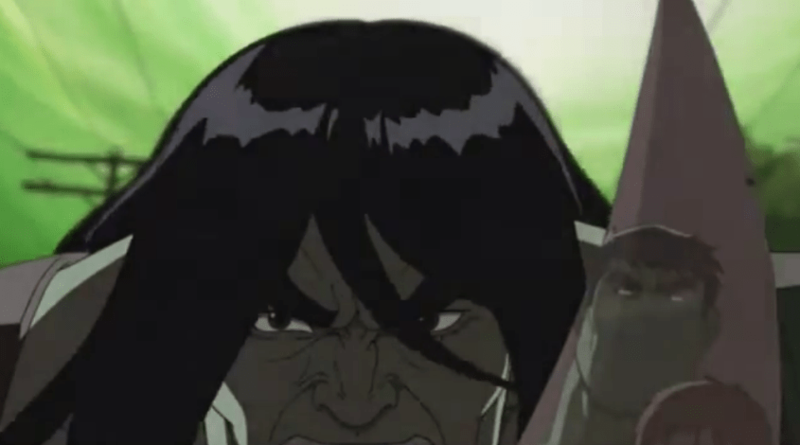 Of course the poop joke and the Hulk in black face in the second episode didn’t help much. Pingback: The Avengers, Phineas and Ferb, and the Agents of S.M.A.S.H. | Biff Bam Pop! 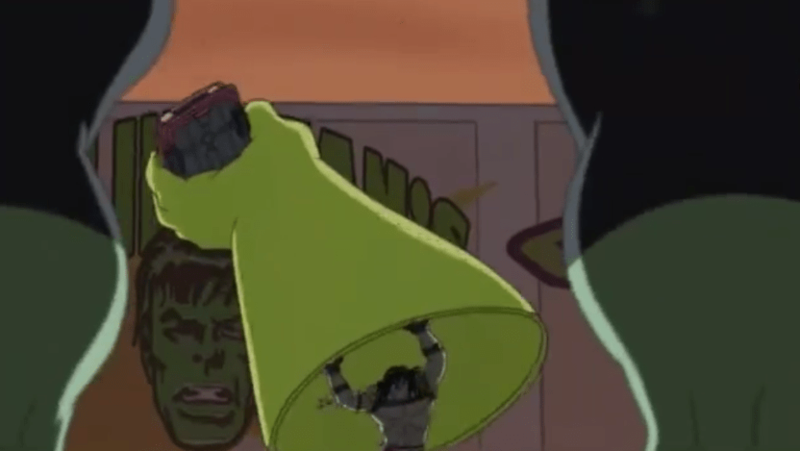 Pingback: Avengers Assemble S01 E11: Hulked Out Heroes | Biff Bam Pop!